Chris Oliver (@BasketballImmersion) is a sharer. 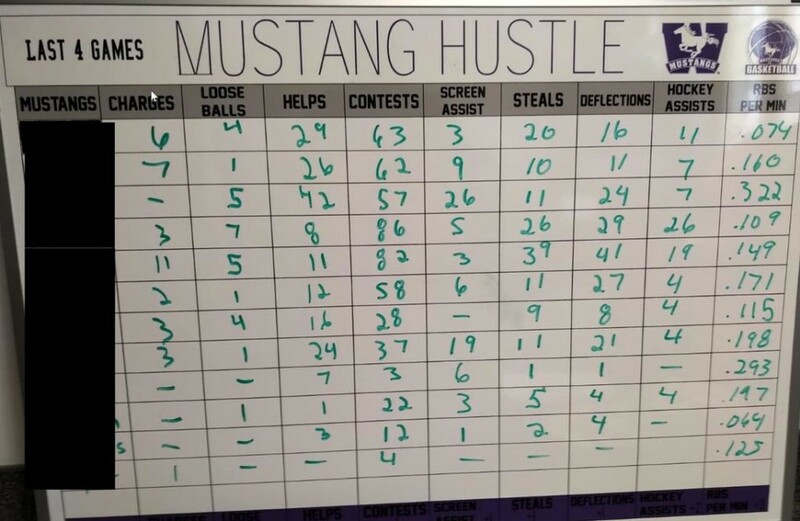 So when he passed on this gem  of an example of a “Hustle Board” designed to track non-traditional stats, my spidey senses perked up. University of Western Ontario men’s basketball coach, Brad Campbell, tracks eight (8) categories that help to define success for his teams. If you had to choose only three (3) of the category of stats, which are most directly causal to a team’s success? (I don’t doubt the correlation of any of these non-traditional stats, yet I’m always conflicted by what one knows versus believes matters most.) any of them on any given night, etc. “Screen Assists” typically reflects the outcome of the final screening action. How can we go deeper to measure if a screen, on or off the ball, primary or secondary, creates an advantage (i.e. big, small, or none)? If no advantage was created, was it because of the screener or user? Shining a light on this gives a coach a more accurate measure of a team’s ‘screen quality’. If an advantage is created from the screening action, is the advantage being used or shared? If not, is the cutter or ball handler not ready to shoot/pass/penetrate? …Or, is the passer not seeing and delivering the ball where/when it’s needed? …Or, is the spacing of the players not involved in the screening action making it ineffective? For on-ball screens (i.e. picks), is the ball handlers lack of vision, dribbling, passing, etc. (in-)ability, what’s sabotaging the team’s ability to use the advantage? Or, is the screener not recognizing the opportunity to slip, pop back, sprint out, short vs long roll, etc? I love how Liam Flynn expresses it: “We screen to create an advantage.” And, that advantage, when used and shared, can create multiple shot opportunities. Screens are set to disrupt the defense, to force players to be late on a closeout, to force (or invite) a switch, create a situation where one defender has to guard two offensive players, to distort the shape or position of the defense, to create time and space to exploit, etc. All of these are different ways of saying: to create an advantage. Screens don’t necessarily create a shot. You don’t always control that—especially against good team defensive schemes. So, stat the thing you do control, the process (of setting and using screens). That insight can be turned in to actionable accountabilities for team and player development. So, in the case of my pick-3 (of the Hustle Board stats) question at the start of this post, it’s easy to say: all of them… or, any of them on any given night, etc. Some will say charges. Others… loose balls… deflections… steals. These types of non-traditional stats have been tracked for decades. Many of them are hand-me-downs – from schools of thought of yesteryear. Don’t get me wrong. They do have utility. Qualitative or subjective stats can be used as great motivators for players, they can be used as anchors for accountability. And, they are great culture builders helping reinforce a shared mentality – or team identity – that fuels a team’s style of play. Some of these categories, perhaps even many or most, may be valid and reliable key performance indicators. Not all non-traditional stats are not all equal. Which ones are most important? In which contexts? How did you come to this conclusion? As a basketball coaching community, I think we still have room to go deeper. We have to welcome someone calling us on our bullsh*t and be willing to call others on theirs. Better yet, we need to get better at saying, “I don’t know,” when we don’t know. Do you have a “Hustle Board” for your team? Are you tracking any non-traditional stats that are key performance indicators at your level? Tell us… What non-traditional stats are you tracking that are “outside the box”?